Brad is a Senior Wealth Advisor and Chartered Special Needs Consultant® professional with Investment Strategists Special Needs Planning. Prior to concentrating his practice on holistic financial planning for individuals with special needs and their families, Brad practiced within the financial services industry for over a decade. Brad's passion for special needs planning is fueled by his son, who has Autism Spectrum Disorder. Brad's goal is to make the world a little bit better each day for the special needs community, and aims to do his part in bettering the financial picture for these individuals and their families. Brad is a frequent speaker at events for organizations representing various special needs and serves the majority of his free time in a volunteer role on the board of the Central Illinois Autism Association, as well as various other committees. 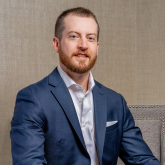 Brad offers a unique combination of youth and experience giving his clients the potential for a long-term planning relationship that could span multiple generations. Investment Strategists Special Needs Planning is a firm located in Peoria, Illinois that offers holistic financial planning solutions for all people. Its comprehensive, friendly approach integrates principles of both conventional and special needs financial planning so that both can flow together seamlessly. Consultation and review meetings are conducted in-person, over the phone, or via web conference based upon the preference and individual needs of the client.